Topographic maps are essential in evaluating geologic, hydrogeologic, hydrologic, and topographic characteristics of a property. Historical topographic maps are useful in determining how topogrophy and property development has changed over time, and they indicate possible risks or concerns. Topographic Maps also known as “Topos” complement our aerial photography as a way to represent the earth’s surface. A topo map is a two (2) dimensional representation of our three (3) dimensional world. Both horizontal and vertical data can be recorded. The characteristics of a topographic map can vary but what is distinctive is that the shape of the Earth’s surface is shown by contour lines. Contours are imaginary lines that join points of equal elevation on the surface of the land above or below a reference surface, such as mean sea level. A contour line displays the peaks and the valleys of the land. It makes it possible to measure the height of mountains and the steepness of slopes. The years shown for the topos may represent reprints of the original. Therefore, the collars may be useful for identifying reprints and other details. 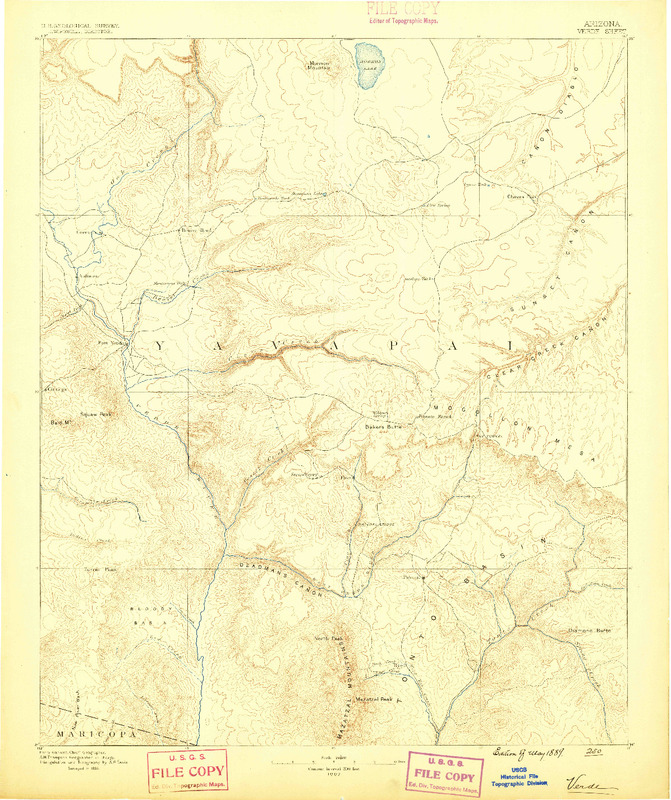 In December, 1884, the USGS began topographic mapping of the United States. The first maps were created at scales of 1:250,000 for 1-degree and 1:125,000 for 30-minute areas. By 1894, most of the maps were 15-minute areas and produced at a scale of 1:62,500. The features shown on the early maps included civil divisions of state, county, township, and cities or villages; manmade structures including acequia, bridges, canals, dams, ferries, fords, railroads, trails, tunnels, wagon roads, and trails; miscellaneous features of forest, sand and sand dunes; and the determination and mapping of the relative elevation of land with contours and flood plain representations. The early maps were made from the field sketches using a three color lithographic printing process based on copper plates. The civil divisions and manmade structures were done in black, bodies of water in blue and contours, depressions and miscellaneous features in brown. Beginning in the 1920s, the USGS began experimenting with photogrammetry as way to replace the time requirements of field sketching. By using a pair of stereo photographs in a stereoplotter by doubly reflecting the overlap area, elevations could be determined. This has been the primary method to plot contour lines on topographic maps since the 1930s. After 1942, the USGS used pen and ink drawings that were photographed to film separations, eliminating the need for copper plates. After a few years the pen and ink process was replaced by use of engravers and scribecoat. Demand for more detail on topographic maps resulted in the 1:24,000 scale 7.5 minute quadrangle maps of the period from 1947 through 1992. With the larger scale, the USGS included almost 200 features separated into color groups for the five color plates to be used in the film-based reproduction process. The five plates include vegetation (green), water (blue), public land survey lines and densely built-up areas (red), roads and buildings (black), contours and other elevation features (brown). Although, no longer used the color (purple) found on the historical topo maps represent feature changes. Starting in 2001, the USGS released The National Map to be the topographic map of the 21st Century. It is a seamless, continuously maintained, nationally consistent set of base geographic data. The new topo maps consist of eight (8) data layers: transportation, hydrography, boundaries, structures, geographic names, land cover, elevation, and orthographic images. Beginning in October 2009, contours and hydrography were added to the new map, which was renamed US Topo. New topographic maps are generated every three years. Earlier versions of the US Topo maps will be archived by HistoricAerials.